Our most popular and beautiful, 2150 square foot home is air conditioned with a cozy gas fireplace and hot tub, its sure to be on the top of your list for best value and cleanest vacation home in all of beautiful Bend Oregon. Booking 24/7 at absolutelybend. walk to the local Starbucks and huge shopping center from your front door. And the Factory Outlets are only one short mile south! With 4 queen beds and 1 king, sleeping 10 to 12 people is easy and affordable, and that makes everyone's vacation to Bend the best. Three full bathrooms and a half will add to your vacationing pleasure. For group stays or a quiet weekend for two, you will be sure to find comfort and relaxation here. Positioned in a quiet, newer subdivision, this property has views of the Cascade mountains from the second story, and its a short drive to downtown and the Deschutes River. Large open kitchen with counter bar large enough for four or more to create memorable dinners! Several Coffee makers with complimentary organic coffee and grinder are some of the standard touches provided to you. As well as hand crafted soaps, shampoo/conditioner, paper towels, and laundry supplies. Pack light! Dining room and living room with cozy gas fireplace sweep together for friendly conversations by the fire that may include talking about the 'slopes' and shopping activities for the day. Kick back in on the new recliner sofa and enjoy your favorite locally crafted beer. Main floor king size master bedroom suite with full bath, walk in shower and television. Upstairs boasts 3 large bedrooms bedrooms with four queen beds (one bedroom has two queens) and two full bathrooms. Open Game room area with additional sleeping area to include a trundle bed, and full size futon with bedding included. All linens and towels provided. CLIENTS CHOICE FOR CLEANING FEE, EITHER leaving the home in the same condition it was accepted in (ALL LAUNDRY AND KITCHEN PUT BACK IN ORDER) or cleaning fee will be deducted from security deposit at the rate of $150.00 for ordinary cleaning. Please observe the 20 MPH speed limit. No parking for RV's. NO SMOKING ON PROPERTY. MAX Vehicle limit 4. 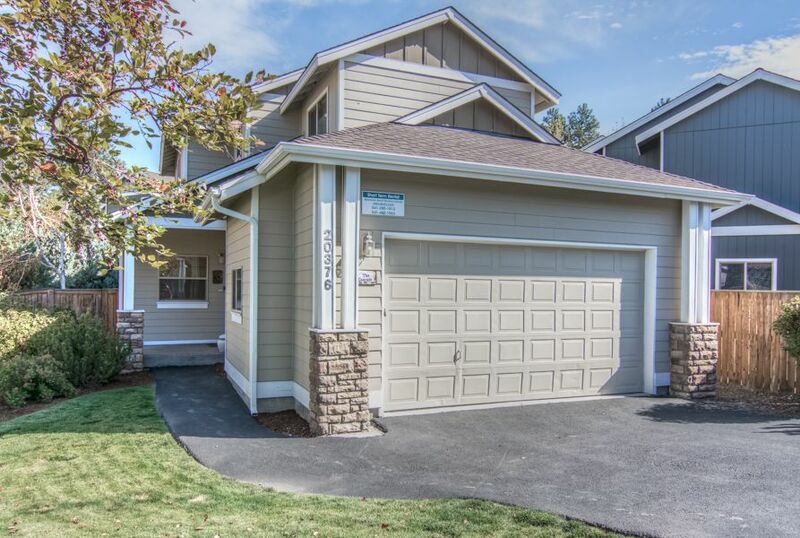 This absolutelybend home is one of our favorite and most popular, mostly because of the floor plan and location, it's right across the street from Starbucks, the Fred Meyer shopping center, and the Factory Outlets are a short walk. The Cascade is quiet and very centrally located to everything in Bend and is always our most booked home. New interior paint and furnishings in late 2016. The layout is great for large groups. Two Full bathrooms upstairs. Full Master bath en-suite and half bath off of the main living area. 4 Person Tub on fenced back patio. Tub closes at 10PM weekdays Midnight week ends, Friday and Saturday Neighbors work, please be respectful. We had a ladies trip to Bend and the house was great for us. Just a couple blocks away from Fred Meyer's grocery store and roughly five minutes to drive downtown. The house had all of the amenities needed to cook breakfasts & dinners for eight. We were unable to adjust the thermostat, so it was a balmy 65 degrees the whole time we were there. Luckily, there was a gas fireplace in the main area downstairs to heat the common areas. Ice machine wasn't running, so we had to pick up a few bags. It was nice to have a large garage we could park two SUVs instead of leaving them on the street. I'm funny about being barefoot, so it would have been nice to know there were no shoes allowed inside before we booked the place. It's not uncommon though and I'm thankful I brought along house shoes. All in all, it was a great place and easily accomodated the eight of us. We would likely book again. Great location, tons of space! Plenty of space for multiple families to enjoy a weekend in Bend. The house is situated in a great location that has easy access to all that the area has to offer. We have stayed in many rental houses over the years and this was one of the best. Plenty of room for my dad, my sister, my husband and me, and our 3 kids. Kitchen was well stocked with everything we needed, which was so nice. Good location, only 10 minutes from downtown and 5 from the old mill area. A great experience overall, and we would happily stay here again. House accommodated our large group well. The house was clean, but as many people stated it is not updated in the kitchen. The appliances were older but they worked. Kitchen is fully stocked. The owner was very nice and came by with a package of coffee. As mentioned in previous reviews the hot tub was not hot enough and it didn't work very well if more than 1 person was in it. The house was in a good location. The place was beautiful and has everything you need. Location was perfect, easy to get around Bend. Would recommend. One block off 3rd Street makes this home very close to all the attractions of Bend.